As they age, seniors are at risk of degraded brain functions. However, new studies show that exercise counteracts the degradation of brain functions and delays the onset of Mild Cognitive Impairment (MCI). And, MCI is a precursor to dementia. Furthermore, exercise benefited both healthy seniors as well as those with MCI. Also, recent studies show that aerobic exercises, like walking, improves senior brain health. Most noteworthy, there are no drugs to counteract the slow cognitive decline. Exercise is the only medication. First of all, the latest results are based on a meta-analysis of 98 studies involving 11,000 seniors. Also, the seniors in the studies had an average age of 73. Furthermore, 59% of the seniors were clinically healthy. Another 26% of the seniors had signs of MCI. Finally, 15% of the seniors had fully developed dementia. Most noteworthy, seniors, who exercised for at least 52 hours over an average 6 month period, had the greatest improvement in their thinking abilities. Especially relevant is that the 52 hours does not translate into 2 hours a week of exercise for 26 weeks (6 months). Furthermore, there is considerable leeway in how you come up with 52 hours of exercise over the 6 month period. For example you could exercise 30 minutes a day on 4 days of the week, or do 1 hour a day on 2 days of the week. Most of all, you can use any other combination as long as the total hours equals or exceeds the 52 hours in a 6 month period. However, studies showed seniors exercising 34 hours over the 6 month period didn't improve senior brain health. And, it didn’t matter if they were healthy, had MCI or dementia. Most noteworthy, both healthy seniors and those with MCI saw the most stable improvement in thinking and the brain’s processing speed. Indeed, the brain’s processing speed is the amount of time the brain needs to process information or carry out a task. In addition, healthy seniors showed improvement in their executive function. Incidentally, the executive function is the brain’s ability to set and achieve goals, plan ahead, come up with strategies, self-monitoring, inhibition, and problem solving. Also, the same seniors had boosted reasoning skills. Most noteworthy, the study found no link between the amount of exercise and memory. And, the weekly time spent exercising (in minutes) was not correlated with improved cognitive abilities. Consequently, seniors need more consistent exercise over a longer period of time to achieve benefits in cognitive performance. However, exercising weekly provides cardiovascular and other physical health benefits. Consequently, to get physical health benefits as well as senior brain health, regular weekly exercise is the best. Therefore 2 hours of exercise a week will benefit both the body and senior brain health. Of all types of exercises in the studies, aerobic (walking in particular) was the most common. Some studies used biking or dancing, while others used combination of aerobic and strength training. Meanwhile, other studies used only strength training. While still other studies used yoga or tai chi. Most noteworthy, the type of exercise did not change the results. All exercise types (aerobic, strength training, yoga and, tai chi) were equally beneficial to seniors’ thinking skills. Also, nearly any type of exercise, from aerobic exercises such as walking, running, cycling to weight lifting, yoga, and tai chi contributed to improved cognitive performance. Furthermore, exercising for 52 hours over a 6 month period, low intensity exercises, like walking, yields the same benefits as more intense exercises. In conclusion, improved thinking skills, executive function, cognitive performance, and reasoning skills depend on the total length of time spent walking . And senior brain health improves with only 52 hours of walking, in any 6 month period. 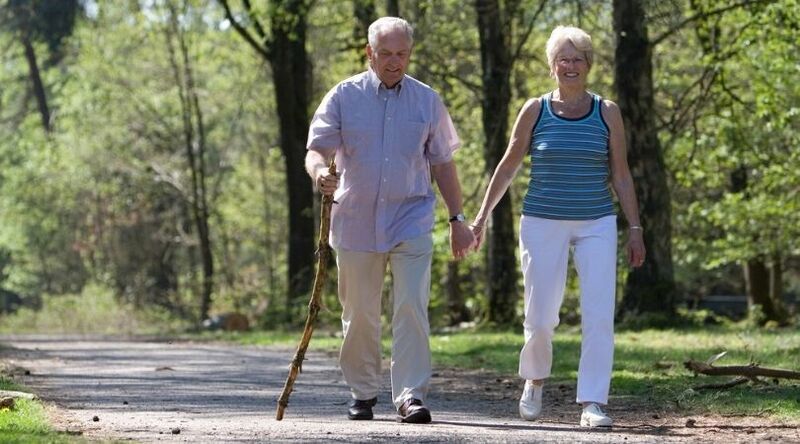 Furthermore, the body and senior brain health improves with 2 hours of walking each week.